Skach Manufacturing Company, established in 1978, is a specialty manufacturer of cold formed parts and fasteners. Our multi-station cold forming equipment uses wire as a raw material to form intricate shapes from a wide variety of metals. Our modern high speed headers and in-house designed tooling are capable of holding dimensional tolerances not normally experienced in this industry. 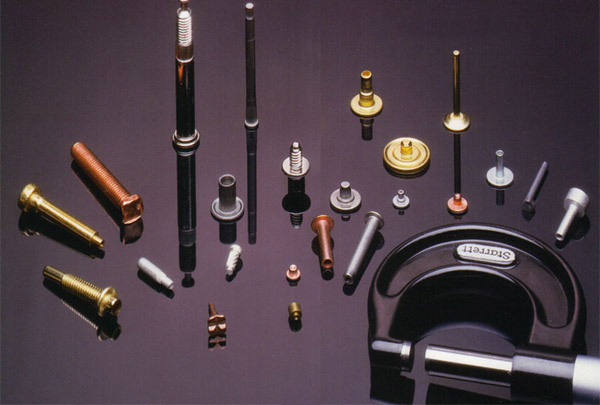 We can manufacture solid and tubular rivets, shoulder rivets, discs, spheres, electrical contacts, pins, threaded fasteners, and cold formed specials. Secondary operations include roll forming, thread rolling, drilling, tapping, cross drilling, pointing, slotting, grooving, and trimming. Skach has the capability to assist in the design phase of your project and supply short run prototypes for test and evaluation. We are prepared to offer high volume production or short runs to meet your required schedules. 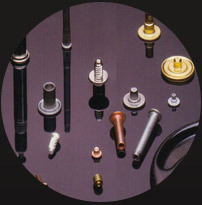 Skach is a full service provider of quality cold formed parts and fasteners. Skach is certified to the ISO 9001:2008 quality standard. We offer our customers supply chain and inventory management, bar coding, just-in-time delivery, and personalized customer support. Contact us directly to learn more about Skach or to request a quote. Send us a PDF file of your cold headed part or assembly so we can begin the collaborative process to successfully complete your project. Raw Material cut-off diameter up to .375"